Cut the crusts from a good homemade type bread and cut into chunks. Process briefly in a food processor or crumble into fine crumbs by hand. Spread out the crumbs on a large flat pan and toast in the oven until lightly browned, about 10 minutes. Toss with the olive oil while still hot. Steam the green beans until barely tender, 5 to 6 minutes. 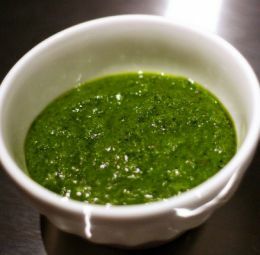 Toss with the pesto and butter while hot. Add the toasted bread crumbs, diced peppers, and salt and pepper, to taste. Toss with hot pasta and garnish with fresh sage leaves. Finely julienned Italian sun-dried tomatoes can be substituted for the sweet peppers. 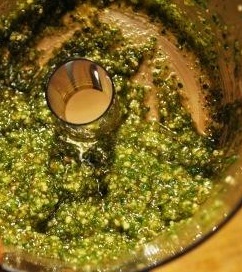 Any basil pesto or Savory Pesto can be substituted for the Sage Pesto. The rich flavors of Sage Pesto, cream, and shiitake mushrooms make a delicious sauce for pasta or spaetzle and for green beans or green beans and potatoes.